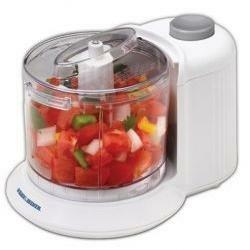 Compare Mini Chopper-Blenders - Proctor Silex, Black&Decker, Cuisinart, Hamilton Beach or KitchenAid? Mini chopper-blender units are not as popular as traditional food processors or stand mixers, yet they fulfill some very specific cooking related functions that can not be conveniently and successfully achieved by traditional blenders or stand mixers. Once you start using a mini chopper-blender, it becomes one of the most useful cooking gadgets in your kitchen which you get to use almost every day. You will find the tool to be very useful in particular when you prepare salad dressings and sauces, when you need to chop tomatoes, herbs, onions and garlic, and even when you need to grind nuts. When you want to prepare the classic French salad dressing, you would normally need to mix thoroughly a tablespoon of Dijon mustard, a tablespoon of balsamic vinegar, 1/4 cup of virgin olive oil, a couple of garlic cloves, and a pinch of salt and pepper. Try mixing that in a traditional blender or food processor! We promise you will be quite frustrated with the process and not happy with results. With a mini chopper-blender the results are immediate, and you will get a perfectly homogenous dressing with no splatter and no waste. The unit will chop the garlic and blend it with the rest of the ingredients into a perfectly smooth dressing within seconds! If you eat salads a lot, this tool will soon become one that you use most! The rest of this article will compare five carefully selected popular mini chopper-blenders to help you choose the one that will respond best to your cooking needs. The units that will be compared are the Cuisinart DLC-2A, Hamilton Beach 72705, Kitchen Aid KFC3511, Proctor Silex 72500RY and the Black&Decker HC306. The brands and models selected here are not only extremely popular among Amazon buyers, but they have also received the best user reviews. A capacity of 1 cup or more, but not exceeding 3.5 cups. Not less than 60-watts of power. It is also good to have a liquid dispensing opening or hole somewhere on the unit, as this comes in very handy when making preparations such as salad dressings or mayonnaise which require oil to be added gradually while the mini blender is running. Note 1: This feature is useful for adding oil when making salad dressing, mayonnaise or other preparations that require the gradual addition of some liquid. If your unit does not have this feature, you can always stop the mini-blender, add the liquid and blend again. So, not having this feature is not a show stopper, but it is definitely a nice to have. Note 2: All parts except the electrical base of these units are dish washer safe. Note 3: All warranties are limited manufacturer's. Note 4: Prices are approximate as they can change any time. Also prices depend on the colors chosen. To see exact prices, please click the product images in the Amazon section below. So which Mini Chopper-Blender to Choose? When buying a mini chopper-blender make sure that the bowl is not larger than 3.5 cups. With larger bowls, the efficiency that can be observed when chopping and blending small amount of ingredients in small containers will be lost, and you will get food splattered all over the interior walls of the bowl. All 5 units described here have bowls with capacity equal to or less than 3.5 cups. All five units provide the must-have features listed above. However, if you want to have an oil dispensing opening on the unit, then you should go for either the Cuisinart DLC-2A, the Hamilton Beach 72705 or the Kitchen Aid KFC3511, as the other two units do not come with this feature. Other than that, it is really a question of aesthetics and price which are a personal matter. Because the Cuisinart DLC 2A has had the most reviewers (624!) with 80% of reviewers giving it 4 stars and more, and because it comes with all the must-have features listed above, it makes sense to consider it as your top choice when comparing mini chopper-blenders. The compared Mini Chopper-Blenders Proctor Silex 72500RY, Black&Decker HC306, Cuisinart DLC-2A, Hamilton Beach 72705 and Kitchen Aid KFC3511 can all be bought below on Amazon.